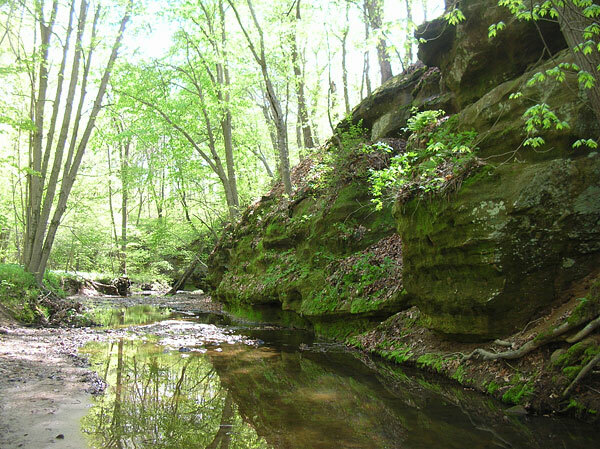 Rocky Branch is one of those out-of-the-way jewels that doesn’t get many visitors; but those of us who visit it regularly appreciate it for its unusual beauty and its relatively unspoiled aspect. 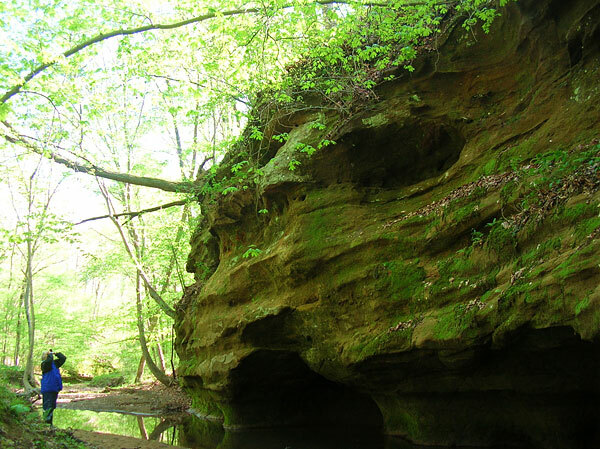 This 130-acre woodland in Clark County that escaped the last glacier is notable for its variety of ecosystems, especially sandstone outcroppings along steep-sided ravines, as well as for species of trees, plants, and even salamanders not found in most of East Central Illinois. There are unusual mosses and ferns, as well as liverworts and lichens on the damp cliffs and overhangs. 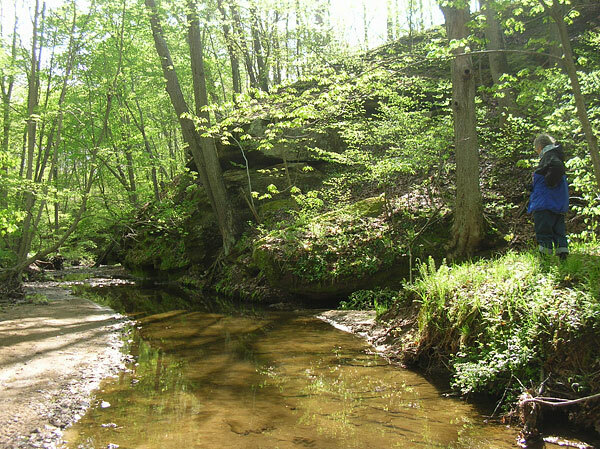 The slopes of the ravines contain American beech, as well as red oak, red maple, ironwood, basswood and flowering dogwood. The extensive upland forest has white oak, black oak, shagbark hickory, mockernut hickory and bitternut hickory. 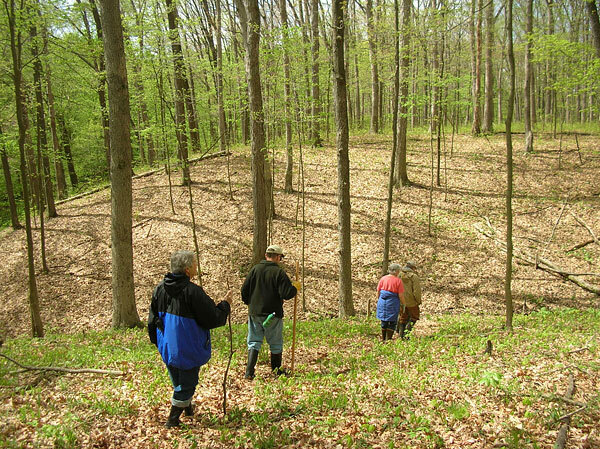 Along the stream there are American beech, tulip tree, blue beech, bladdernut and spicebush, as well as sycamore and sugar maple. 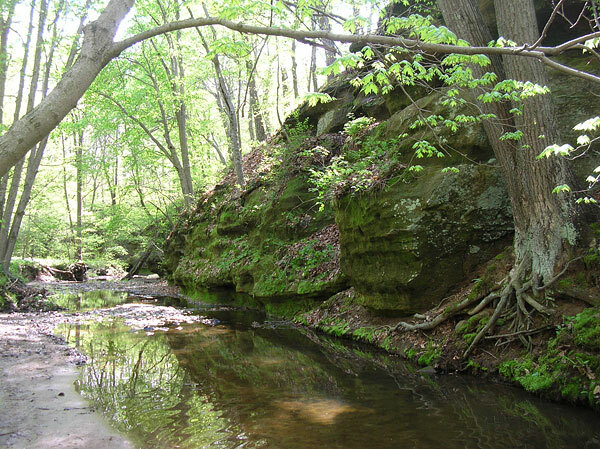 Botanists have studied Rocky Branch since the 1930s because of the many plants that are out of their normal range. John Ebinger and Gerald Hellinga did a complete inventory in 1967-68 in which they found 445 species of trees, shrubs, vines and herbaceous plants. As with most of our remaining woodlands, the absence of fire since European settlement has allowed fire-sensitive trees like sugar maple to invade and change the character of the original forest dominated by fire-resistant oak and hickory. Several years ago the Illinois Department of Natural Resources conducted a prescribed burn in part of the upland forest, with the result that a great many white oak saplings are now growing there.